I was ready to turn 40, in fact, I was actually looking forward to it. With six months to go, I felt prepared and ready for the next chapter. I had accomplished a lot in the past 40 years and I was excited for what was upcoming. For those of you over 40, I wonder if you found the same conflicting emotions. On one hand, I still felt like a teenager and I realized that fart jokes would always be funny, but, I also saw that spending my days as a senior were not as distant as they once were. In the same day, I would be bombing through the monkey trails in winter on my mountain bike, but, then also think that I need to put on foot spikes in the parking lot so I don’t slip and get hurt. I was even called an old man at hockey once! I have been called a lot worse, but, being called an old man hurts. That’s cruel. Turning 40 was an interesting time for me. Due to passing that milestone, I evaluated the gifts I had been given, and the gifts I still had to give. I have had several mentors from my parents to managers, teachers, and coaches, and I have been actively focused on formally sharing the insights I have gained. 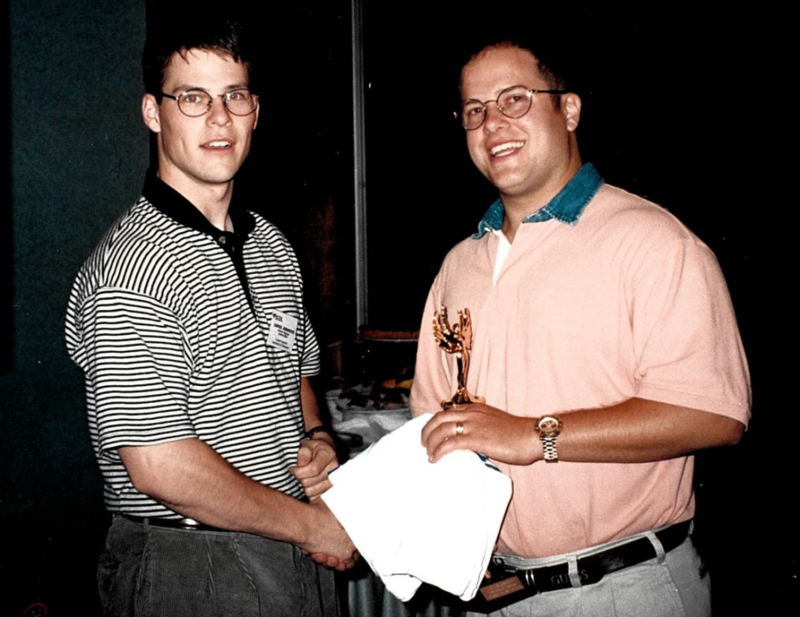 Very early in my career, I had the remarkable experience of working with Vector Marketing and selling Cutco Cutlery. As a recent university grad, this was my first exposure to sales. Cutco is simply an amazing product and I have proudly used it daily since 1995. I quickly advanced into the Branch Manager training program, and that was where I had the good fortune of meeting Joe Cardillo, whom to this day I still see as a mentor. Even though we have not worked together for over ten years, he is often one of my (if not the) first calls anytime I have good news to share. When I was in my early 20’s, I earned my promotion to District Manager with Vector Marketing. My wife, who was my girlfriend at the time, was taking a picture at the ceremony and she was having trouble because the cap was still on the camera. I quickly and quietly pointed it out to her but I had a bit of a snarky tone. Joe didn’t say much but he made it crystal clear within a nano-second that my comment was unacceptable … especially in public. I reflect on that situation often and it has served as a reminder to always provide negative feedback in private and recognize people in public. I have never seen a downside to making someone feel like a champ in front of others. Joe taught me the value of after-tax dollars. If you save $1 it is really like saving two since $1 in hand is after you have paid income tax on it. He also taught me to never forget the value of $100. One time, Rebecca and I rolled up to his house with a convertible that we had on a test drive. Joe had a Jaguar but he could afford it. He also bought it slightly used so he saved a lot compared to buying new. Joe commented that the car we had on a test drive cost more than his, so once again, Joe didn’t say much but his message was clear. When my family was just getting established, Joe gave us a bunch of his daughters’ hand-me-downs. As it turned out, we had three girls and we put those clothes to good use. Our family has received a lot of generosity from others and we give back as much as possible. We have passed on those clothes and purposely look to help others who are in the same position we were in. “Discipline yourself to do the things you need to do, when you need to them, and the day will come when you will be able to do the things you want to do!” This philosophy has helped our family make tough decisions and to stick it out during challenging times. While earning my MBA, we had our third daughter, and shortly after buying a second house (our first investment property) I was laid off while Rebecca was still on maternity leave! Within a couple months, I started a great new opportunity, with Travel Manitoba, but it had me travelling 8-12 weeks a year. Travelling to Asia, Europe and across North America was great, but it was hard on our family and difficult to focus on school. Important side note: The greatest thing I ever have done was meeting Rebecca and convincing her to spend her life with me. She is amazing and kept us moving forward. It was tough for us but we knew that it was just short term pain and that we would come out stronger for it. Looking back, those two months where we were both at home were some of our best times in our 25+ years together. “You will get all you want in life if you help enough other people get what they want.” There are many that may not agree with this and there are definitely benefits to the few who succeed on the backs of others. But, I strongly believe that we can become successful at the service of others. Help your customers look great. Help your community run more effectively. Help your staff advance in their careers. Hire a student and show them the ropes. Volunteer with a local charity. Outside of the direct benefits to the people you are helping, I am confident that you will see that one of the best ways to learn something is to teach it to others. There are a lot of parallels between my time with Joe and my time at Bison Transport. For those of us with the benefit of working at Bison, it is likely that you have noticed a strong culture of mentorship. 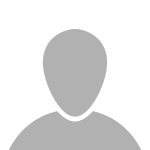 Our Driver Finishing Program is industry leading. Rather than turning away less experienced Drivers, our Driver mentors provide personal guidance to develop their confidence and skill. We also purposely match employees and supervisors with managers and executives. Even our executives seek mentorship from other business leaders both within Bison and in the wider business community. As I move into the next chapter of my life, I am looking to more formally give back through mentorship. I readily admit, I don’t have all the answers, so, in preparation for being a mentor, I asked the advice of a seasoned mentor. 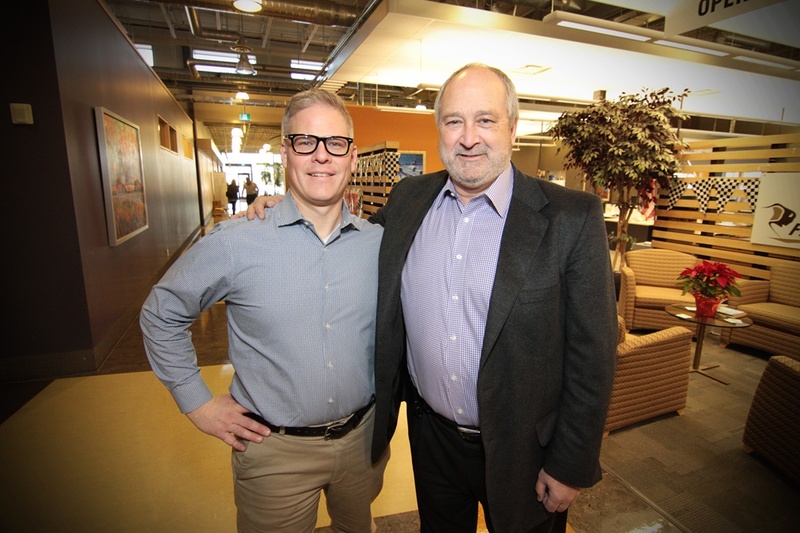 I asked Don Streuber, our Executive Chairman at Bison Transport, for feedback on my area of the business (Corporate Marketing) but also mentioned that I wanted his insight on mentorship. We had a great talk and he shared several insights and philosophies with me. Outside of his advice, the main thing that struck me is how I felt during and after our meeting. Don is responsible for a lot of people, yet on that Friday afternoon, he gave me as much time as I needed. At least for that moment, I felt like I was the only person that existed to him. I mentioned to Don that I saw a lot of similarities between him and Joe. They are both humble, charismatic, wise, approachable and extremely successful. If I could summarize all of their characteristics into one thing, it is this: When you spend time with Joe or Don, you feel great. You feel special and you feel inspired to affect change and help others. The effect that one person can have on another is quite amazing. 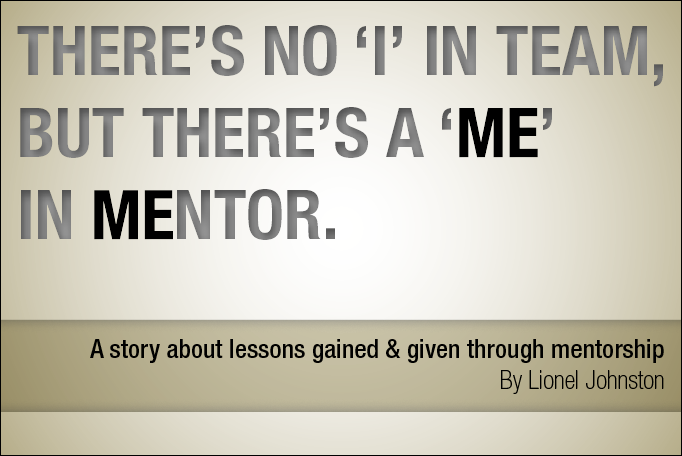 If you have already benefited from a mentor, I encourage you to give back. If you have yet to meet your Joe or Don, I promise that they are out there, and I will leave you with some advice that Don shared with me. He asked me, “Have you ever said ‘No’ when someone asked you for guidance? Has anyone ever told you ‘No’ when you asked them for guidance?” I responded ‘No’ to both cases. He then stated that in his experience, one of the biggest reasons why more people don’t have mentors is they think potential mentors are too busy to help someone like them or they won’t want to help out. The reality is, leaders realize that they were mentored along the way and they love to share their experiences. So, you don’t have to sell them on helping you, you just have to ask! 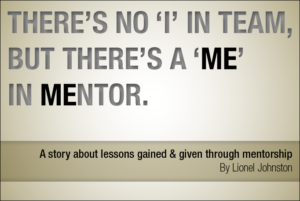 This is the third instalment in our mentorship blog series. Click to read the first and second instalments. Please share your mentorship stories in the comments section below!